When most people think of the band KISS, painted faces, platform shoes and pyrotechnics come to mind. But delve a little deeper and you'll find much more to the veteran rockers. 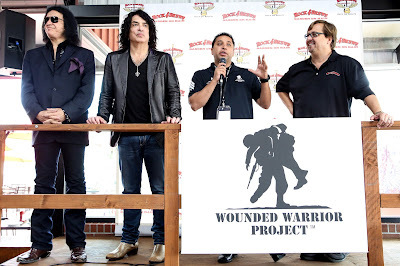 KISS co-founders Paul Stanley and Gene Simmons are also savvy businessmen and active philanthropists who used the occasion of the grand opening of their Rock & Brews restaurant in Torrance, California, on Wednesday to honor wounded military service members. Stanley and Simmons invited members of the Wounded Warriors Project to a free lunch in their honor at the new Pacific Coast Highway location of their restaurant chain. The national nonprofit organization works to honor and empower wounded service members, help them adjust to life after being injured through various programs, and enlists the public to help in these endeavors. When asked why they got involved with the Wounded Warriors Project, Simmons responded, "Why wouldn't every American--past, present, and future--not want to be? Why don't we all get a good kick in the nuts and wake up to the fact that our lives are made possible by people who volunteer and risk their lives and after they make the ultimate sacrifice?" photo: Chelsea Lauren/WireImageSimmons, who's very outspoken about his political leanings and has expressed his great respect for American soldiers who rescued his mother from Nazi Germany concentration camps during World War II, said he thinks it's every American's duty to honor the troops. "Remember it's not a draft, this is a volunteer military that goes over there," he said. "And when they come back home physically wounded, mentally wounded, the least we can do is honor them. It's time for America to straighten its back and, pardon my French, shut the f*** up. When the American flag goes up there, it actually does mean something. These are people who make that flag mean something, because the rest of us are sitting out here at Rock & Brews having a great time and assuming the rest of the world is like this. Well it's not. There are bad guys out there…our men and women of the military make sure that we can have a day like this." Stanley pointed out that his band has raised nearly half a million dollars for the Wounded Warrior Project by donating $1 from each ticket sold on several concert tours. "These people fight voluntarily to protect the freedoms we take for granted," he said. "It's insane. So for us to not put a spotlight on them would be criminal. When we tell people to say the Pledge of Allegiance and say this country is great, let's not forget the people who made it so." Throughout the afternoon, Simmons and Stanley shook hands, posed for photos, and gave a presentation honoring the military members. "We're coming into this neighborhood but we're not here to put our eight-inch KISS heels down," Stanley told the crowd following a military flag ceremony that included Jimi Hendrix's screeching guitar rendition of "The Star Spangled Banner." "We want to help the neighborhood and those who risk their lives for our freedom. We don't have to do this--we're rather wealthy--but we want to be good neighbors," he said. 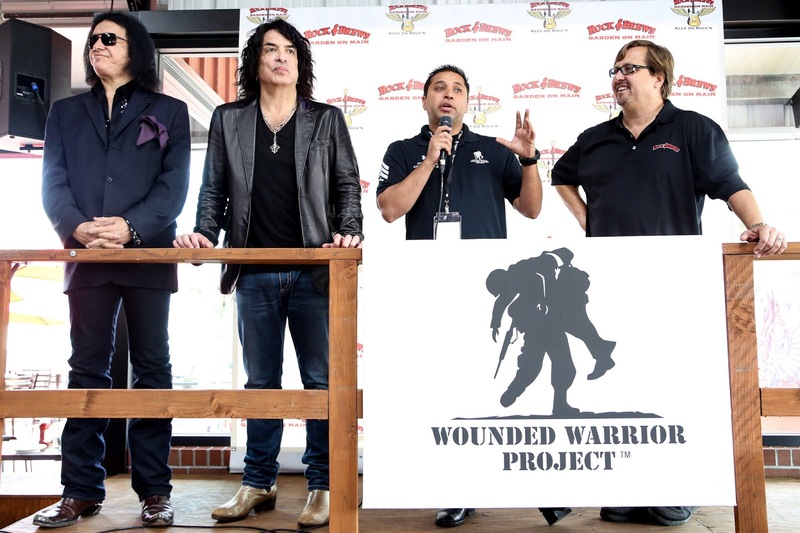 Many wounded service members seemed thrilled to have the opportunity to meet the the famous rockers, but they were also mindful of those who couldn't make it because they were in too much pain. "It's hard for many of us to get out of our house because of the pain," said Wounded Warriors spokesperson Sonny Seyedi, a retired Marine who was injured in Iraq. "This building could be a support system for us--it's rock 'n' roll, Wounded Warriors, and the community coming together." Soldiers wearing casts and braces lined up to shake hands with Stanley and Simmons, and some asked them to sign band paraphernalia or meet their mothers. "They're my favorite band in the world," gushed Charlie Hayes, a wounded Army soldier wearing a band T-shirt. "We're in the KISS army now!"